The object of the game is to guide Bugs through a series of rooms collecting carrots to save Honey Bunny. However, four rascals are guarding the castle: Sylvester, Daffy Duck, Yosemite Sam, and Wile E. Coyote. 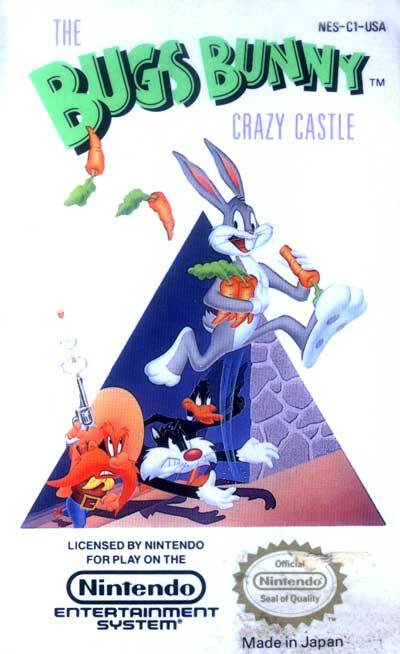 While presented in a side-scroller format, Crazy Castle differed from standard side-scrollers such as Super Mario Bros. in that Bugs Bunny (ironically) did not have a jump function; therefore, only by taking different routes could Bugs avoid enemies. Some of the levels had boxing gloves, invisible potions, or safes that could be used against the enemies in the game. As a result, the game had a "puzzle-solving" atmosphere. Because most NES game cartridges lacked the ability to save, passwords can be used to start at a certain level in this game. This is an especially helpful feature of the game, as it would take longer to complete the 80 levels than is really feasible for one sitting.